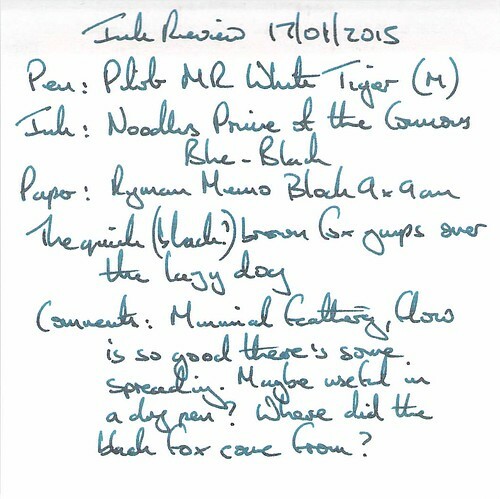 This batch of reviews is for two trios of the staple inks – black, blue and blue-black. 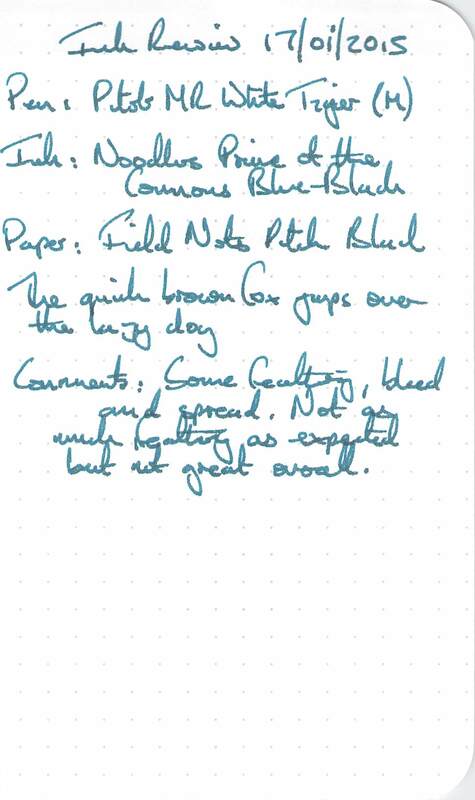 Blue-black inks are not amongst my favourites, and strictly speaking the slot should have been taken by Noodler’s Blue Black, but I aleady had a bottle of Prime of the Commons Blue-Black and didn’t feel an overwhelming temptation to but another bottle of blue-black ink just for this batch of reviews. No doubt the completist in me will take me back to that ink one day. 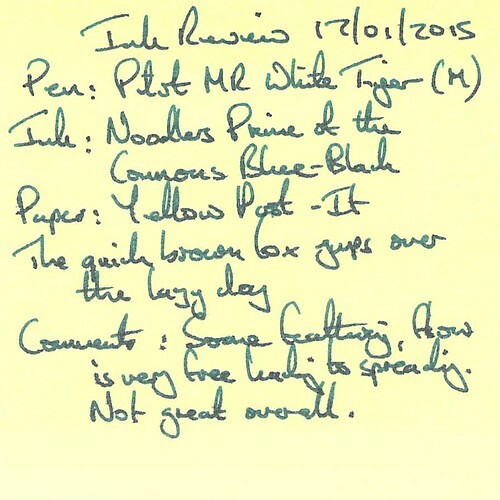 As mentioned above, this ink is exclusive to one supplier in the UK. 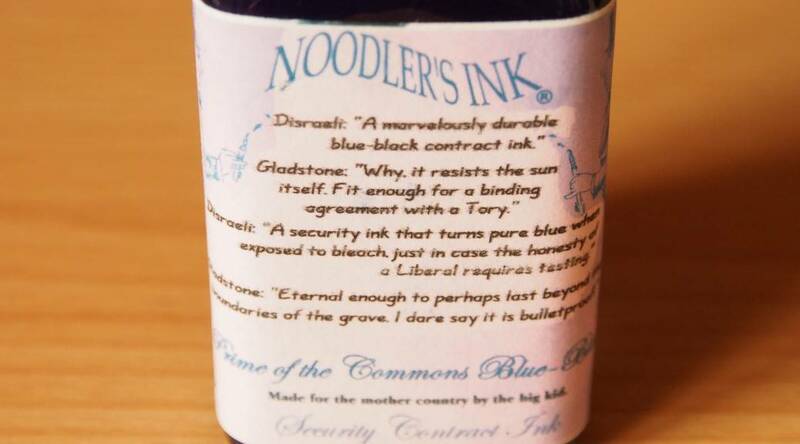 The label states that the ink is a “Security Contract Ink”, and features what appears to be an imaginary conversation between two UK parliamentary rivals of the 18th Century, William Ewart Gladstone and Benjamin Disraeli. 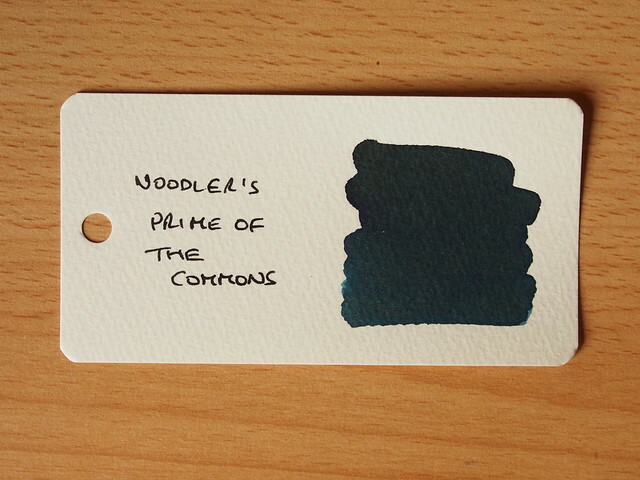 I had assumed that the term “Prime of the Commons” was another term for the Prime Minister (an office which both politicians held) – however a quick search revealed only articles mentioning this ink. So if the term has any historical significance I couldn’t find it. If any readers know differently please feel free to post a comment – I would welcome it. 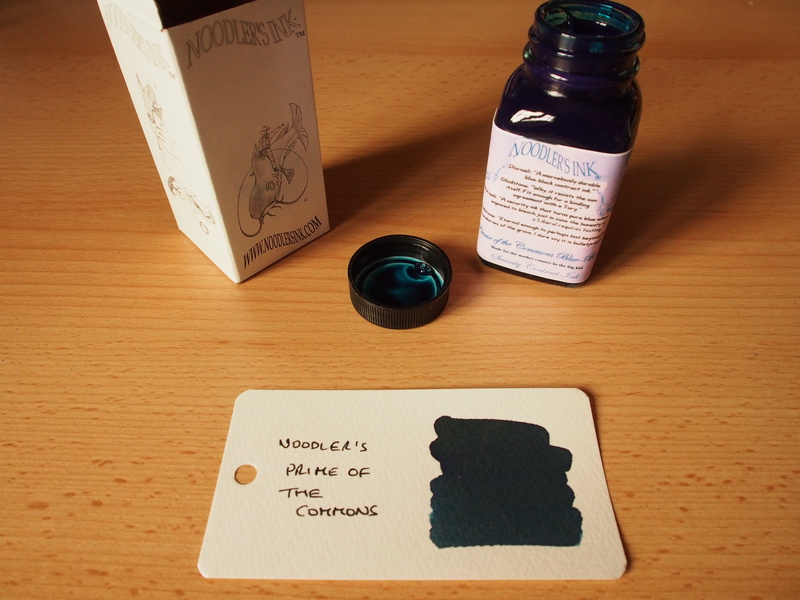 The ink cost £12.50 direct from the UK, which I would consider to be a low price, considering that is for a 3oz bottle (full to the brim as usual). The box is the standard black and white line art. 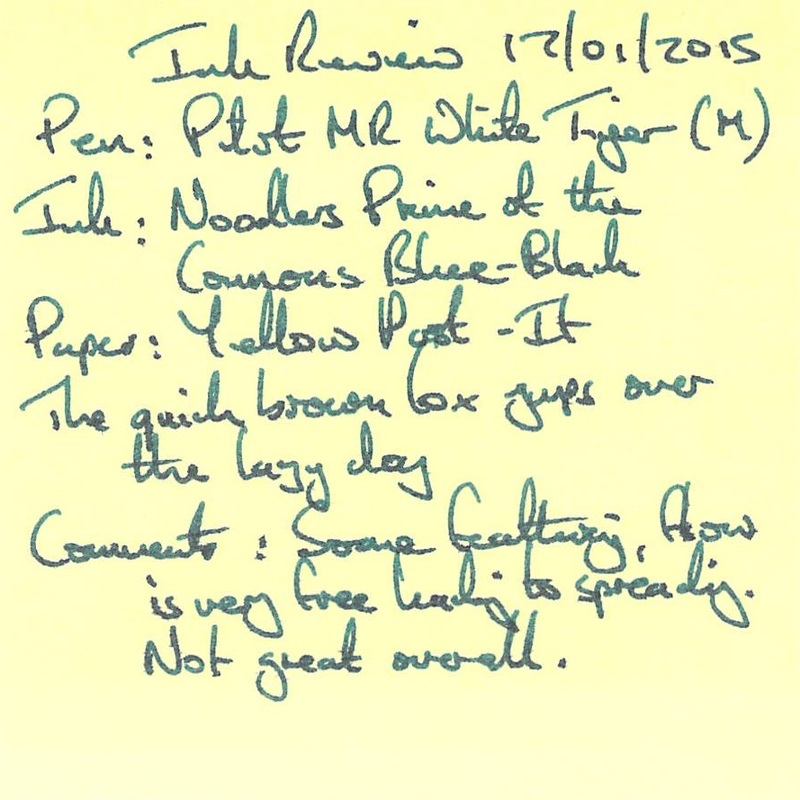 The test pen was a Pilot MR White Tiger with a medium nib. Water resistance was high with minimal colour run. Cleaning was more of a challenge – with some stubborn clots which were hard to get out of the feed. This was after several weeks but in marked contracts with Noodler’s Blue, which has been in it’s pen for the same length of time. I would recommend good pen hygiene with this ink. Dry time on Rhodia paper was quick at around 20 seconds. One security feature of this ink is that it turns blue when exposed to bleach. I did try this out, and while there was a change it was not much as I expected. 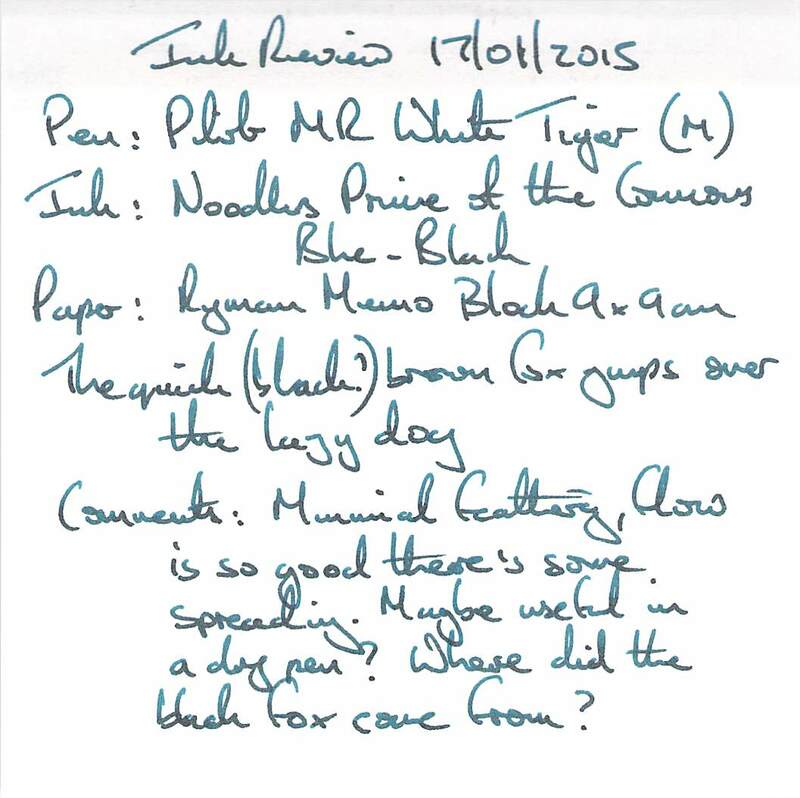 I doubt is would be obvious unless the bleached sample were to be compared to untreated ink. Overall performance was satisfactory, and once dry the greenish tint seemed less pronounced (or at least more attractive on a second look). 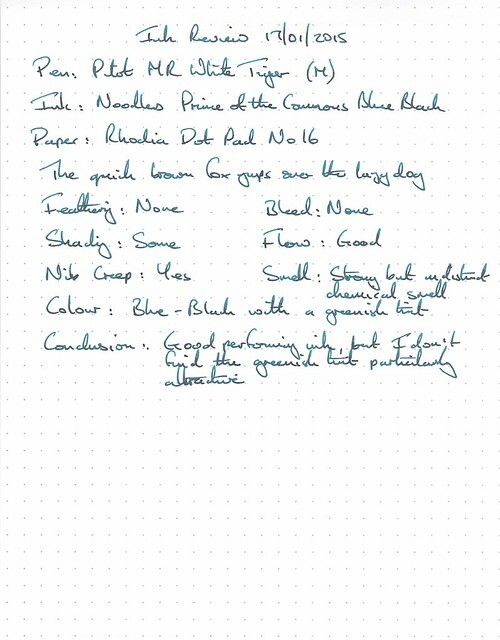 Similar to Rhodia, but with a bit more spreading. Feathering and spreading – not great. Not as much feathering as expected, but spreads and bleeds, so not great overall. This looks a little on the dark side compared the the actual writing samples. The results for this ink are mixed. On better papers the results are okay, but I’m still in two minds about the colour. The quick drying and water resistance are bonuses. On more challenging papers the results are poor. Perhaps for signing cheques or contracts this would be a good ink, but let’s face it those aren’t daily tasks any more, and I don’t think it would be a good idea to keep a pen inked up on the off-chance that it may come in useful one day. 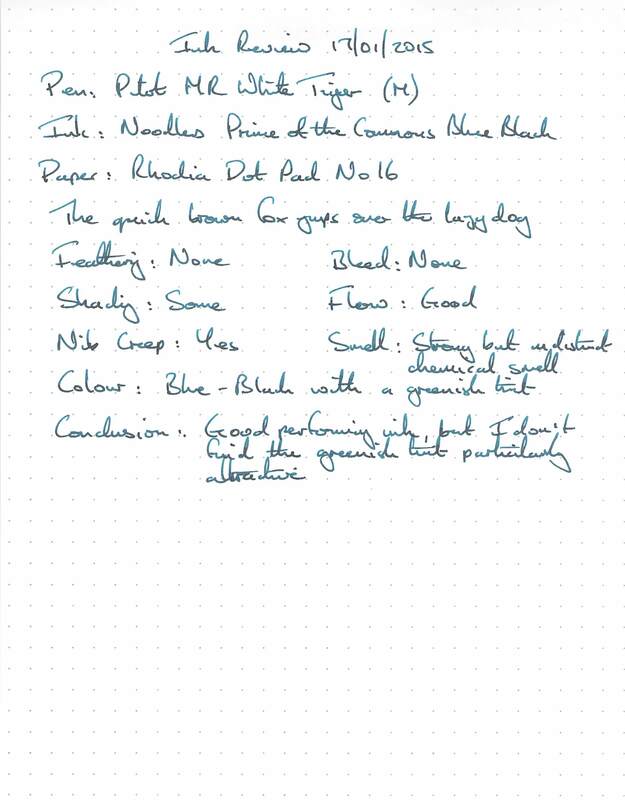 I can only really recommend this ink if you like the colour and are likely to use it on a daily basis on good paper.